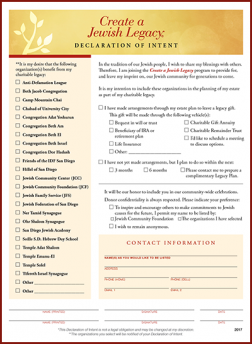 Click on the image to see the complete list of all those who have committed to legacy gifts that will support Jewish life for generations to come. 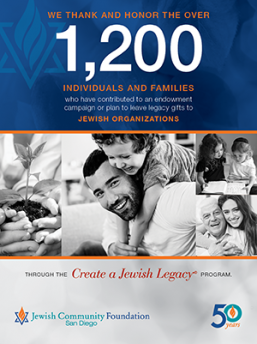 We enjoy helping people Create a Jewish Legacy to support Jewish life for generations to come. What will your legacy be? Every individual has a unique family and financial situation. The Foundation takes great care as it fulfills the role of trusted charitable advisor. Our objective is to support your philanthropic goals. To learn more about legacy planning, contact Sharleen Wollach, Vice President, Operations, or call 858-279-2740.